The pain of pain meds – Pain medication prescriptions are difficult to obtain and scary to use. What horror stories do you have because of new laws? Maybe you have been treated badly at the pharmacy or by family members? Tell your story today. I saw today’s prompt and it immediately reminded me of how lucky we are here in the UK. I’m sure many patients here are unaware of just how difficult it is for our fellow patients, in America particularly, to obtain pain meds, or even just their RA meds. I’ve never walked into a doctors appointment thinking how much is this going to cost me. I’ve never been refused pain medication. I’ve never had to choose between getting this month’s meds or buying food or petrol. I’ve never had to be drug tested before being prescribed the next months pain relief. Unfortunately all of these are everyday day realities for RA sufferers in the US. I’ve posted previously about pain meds, and no doubt will do again, it’s a topic that is unfortunately treated with disdain and judgment by many, including the more ignorant amongst our journalists and politicians out there who happily call us addicts with no knowledge of the very real decisions we take daily about our pain relief. I often think the biggest misapprehension about pain meds is that they take away the pain.I wish! What they do is dial it down. Think of it as listening to music really loudly, then turning the volume from 10 all the way down to 2. It’s still there in the background, but at the lower level you can work around it, and get on with your day. Second annoying misapprehension? We’re all getting high. Cue loud ironic laughter from across the chronic pain community. I have never gotten high from a pain med, not even opioids which I use daily. I’ve been nauseous, and occasionally even vomited. Not exactly tempting me to up the prescribed dose or take extra for a laugh. Yet that is my choice when my pain is really severe, I can take oxycodone and stop wanting to cut a limb off, knowing that instead I’ll feel severely nauseous for the next hour. But – at least I can get my medication. My GP prescribes my pain meds without fuss. I’m guessing this is because we have a good doc/patient relationship, we discuss regularly how I’m doing and she knows I don’t overmedicate or abuse my pain meds ergo I have no problem with getting them. I honestly don’t find using pain meds scary. Maybe because I see them simply as one of the tools in my RA toolbox, they sit there alongside heating pads, voltarol gel, my RA meds, compression gloves, wrist splints, crutches, meditation, aromatherapy etc. I also don’t buy into the addiction BS that the press tends to throw around. I don’t know the figures for the UK, but I do know in the US addiction rates among patients who are prescribed opioids is less than 4%. Opioids just aren’t the big scary med they are made out to be. I worry more about the potential effects on my liver. So, yes, I will continue to use my pain meds, and I will do so without any shame. I will also continue to try and educate anyone who chooses to judge me, or anyone else, for making an informed and rational decision about how I manage my pain. 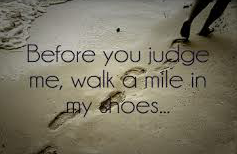 Walk a mile in my shoes….. Previous Post#rablogweek 3 – Coping with Depression Next PostZombies Have More Energy!